Justin Mott is a native of Rhode Island with a journalism background from San Francisco State University. Justin received the Greg Robinson Memorial Award, given to the College Photographer of the Year for San Francisco and the Bay Area. In 2007 he was accepted into the Eddie Adams Workshop in New York and the University Missouri Photo Workshop. Justin has been working in SE Asia since 2005 and currently resides in Hanoi, Vietnam. He is represented by WPN. Justin is also co-founder of On the Road Media with producer/reporter Laura Lo Forti. His personal projects and assignment work has been published in Time, Newsweek, New York Times, Business Week, Geo, The and various other international magazines. Justin recently won The Marty Forscher Fellowship Humanistic Photography Award. Editors note: Jason was one of the first photographers I contacted after beginning Verve Photo. His interview at The Travel Photographer is a candid account of his working methods in Vietnam. Born in 1973, French photographer Frederic Sautereau is also director of the Oeil Public agency in Paris. His central themes are the dual notions of border and divide. Between July 1997 and April 2000 his work focused mainly on divided cities, namely Belfast, Nicosia, Mostar, Jerusalem and Mitrovica. The resulting series was exhibited at the Visa pour l’image festival in Perpignan 2001 and is regularly shown in the FNAC galleries of photography. From June 2000 to August 2003, he devoted himself to the Lisières d’Europe (The Edges of Europe) project. In 2003 he received the Fuji Prize for a work on the wall separating Israel and the West Bank. His work on New York in the aftermath of the 11 September attacks has been shown in France, Germany, Switzerland and Portugal and was published in book form as ‘N40°42’42” W74°00’45’ by Editions 779 in September 2003. Posted by Geoffrey Hiller in Uganda. Christian Als was born in the countryside just outside Copenhagen, where he is based. Most of his work centers on ‘concerned photography’ and social issues all over the world. In 2006 he graduated from the Danish School of Journalism and soon won several International photo awards including BOP and was a finalist in Visa D’Or 2005 in Perpignan. His work has been published in Der Spiegel, Christian Science Monitor, Bücher Magazine, Urban, ARENA, and Surfer Magazine among others. Christian won the POYI feature story award in 2008 for his project on juvenile prisoners in Latvia and most recently the China International Press Photo Contest for the “India Rising”. The urban extremes can be hard to take in the Indian mega cities. A new golf course has sprung up in downtown Mumbai, while new skyscrapers are being built in the background. Home to 19 million people, Mumbai is projected by 2012 to be the planet’s second most populated city, after Tokyo. Posted by Geoffrey Hiller in Yemen. Maciej Dakowicz was born in Poland in 1976. He has been living in Cardiff, Wales since the end of 2004. He previously lived in Hong Kong while working at the Hong Kong Polytechnic University shortly after graduating from university in Poland with a Master degree in Computer Science. He is a member of the Wide Angle photo agency and a frequent contributor to Need magazine. Maciej has worked with various international NGOs and organizations and his photos have been published by numerous international magazines. He is planning to become a “full-time photographer” by the end of this year, after completing his PhD, which he started before getting into photography. 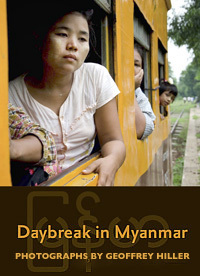 With the help of musician/ethnomusicalogist Rick Heizman I photographed and produced Burma: Grace Under Pressure eight years ago. BURMA DISASTER – AND WHAT WE CAN DO. David Walter Banks (b 1982) is an Atlanta based photographer specializing in editorial and commercial photography through conceptual portraiture and documentary work. David attempts to create images that transcend their everyday context and lean towards the surreal. David’s clients include The New York Times, Stern Magazine, Forbes Magazine, Fader Magazine, Golf Digest, Spin Magazine, XXL Magazine, Sporting News, and Interscope Records among others. When not on assignment, David can be found photographing personal work and hanging out with his dog Highland. This photograph was made while traveling through Guatemala and documenting it’s people and culture for a month with photographer Kendrick Brinson. The image was taken during a religious processional around the Parque Central in Antigua, Guatemala. The processional followed a cacophony of firecrackers which covered the street of the town’s square. This old man playing the flute and young boy playing the drum led the the candlelit procession as they chanted and played instruments on New Year’s Day. David also documented the epidemic of childhood malnutrition in the country during the same trip. Susana Raab is a documentary photographer who began her career as a photojournalist in Washington, DC covering politics. She worked for the New York Times Washington bureau for four years before attending graduate school at Ohio University’s School of Visual Communications. Her two long-term projects: Consumed: Fast Food in the US; and Off-Season: America at Leisure have received recognition from the White House News Photographers’ Association, The Ernst Haas/Golden Light Awards, PhotoLucida’s Critical Mass, American Photography 28, The Santa Fe Center for Photography and Photo District News. Her work is widely exhibited, both nationally and internationally, most recently at the Arts Club of Washington, the Museo de Arte Contemporaneo in Madrid, and the Noorderlicht Photofestival in the Netherlands. Scott Dalton is an award-winning photographer and documentary filmmaker based in Bogotá, Colombia, where he has covered the civil conflict and drug war for the past eight years. His photography has appeared in the New York Times, the Los Angeles Times, Time, Newsweek, Business Week, the Washington Post Magazine, and The New Yorker, among other outlets. His documentary film La Sierra (2005) won numerous awards and was broadcast by PBS, BBC, HBO Latino, and many other international broadcasters. Scott is a member of Metro Photo Collective. The image is of a traditional Christian Funeral for Matiah Nalla, in a leprosy colony on the outskirts of Khammam, India. An elder who lost his hands and feet as a result of leprosy, his son Nathaniel is washing him as they prepare him for burial, which is uncommon for India because the skyrocketing land prices. John Loomis began his photography career as a stringer for the local newspaper at just 15. A dozen+ years later again back in his native Florida, Loomis specializes in action, documentary, editorial, portrait, and travel work for a diverse group of magazine and advertising clients. Deeply passionate for long-term photojournalism, John is also the Editor in Chief of Blueeyes Magazine. Select editorial clients include: AARP, Architectural Digest, Audubon, ESPN the Magazine, Elle, Essence, FADER, Fast Company, Fortune, Mother Jones, New York Magazine, The New York Times Magazine, Newsweek, Outside, People, Rolling Stone, Smithsonian, and The London Sunday Times Magazine.